Now Tony is one of those very clever fellows who loves all things mechanical and tries to build a bike a year he also has family and a group of mates who much prefer riding bikes they have built themselves and have fun. keeping many of the jobs between themselves and often in Tonys shed, well until he had to shoo them out to work on his own bike. His previous bikes included in 2013 ripping apart a brand new yam 1100 sports bike much to his good ladies amazement, in 2014 he created a Honda cb550 café racer which was displayed at the bike shed, but Tony really prefers to build and ride than show, and after selling the café racer and not being able to afford a BSA he started on the XS650, hence the clever mix of badges which his daughter created. The donor bike for this build is a late model XS650 of around 84 vintage and all modifications have been made by Tony himself after a full strip of the bike, the only job that was farmed out was re-lacing the wheels with the stainless spokes. Most of the bike is powder coated and there are lots of neat touches and some subtle highlights in brass, running without front mudguard and a battery too keeps the bike in the skeletal look. Thankfully like me Tony would rather ride than clean, hence the powder coat though he did make the effort to clean the bike just before we met. Typically the sleet started during the shoot yuck. so over a cuppa we discussed, life the universe and what makes the bike world tick. And this years bike? 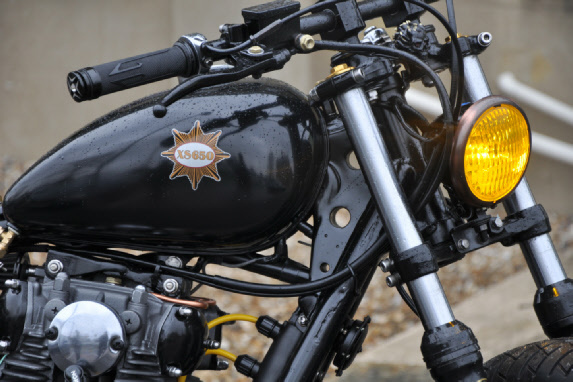 I have had a sneak peek and even in the raw it is a smart brat style bike I look forward to bumping into Tony and his friends.